Changing your car’s air filter, particularly if its airbox was intelligently engineered, may be the most satisfying aspect of automobile ownership. Maximum Billy Mays voice: I love swapping air filters and so will you! 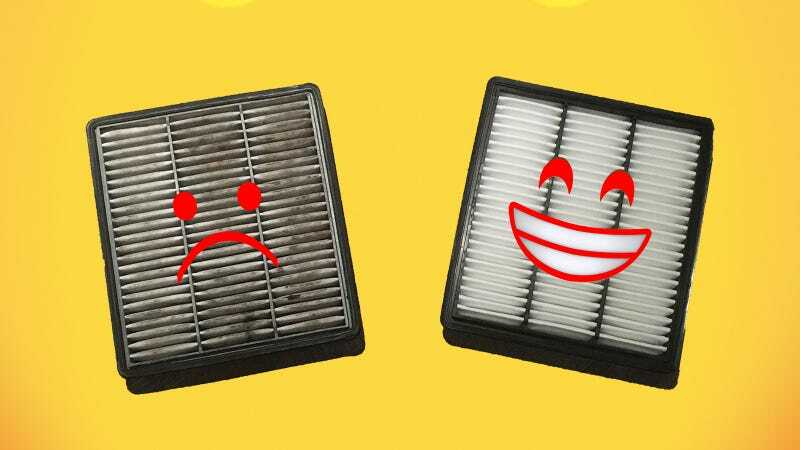 As you may well know, your car’s air filter protects its engine from inhaling moisture, debris, sand and the surprising amount of random road soot you power through every day. Driving with a dirty air filter is like having a nose full of boogers–stifling, uncomfortable, deeply satisfying to clear out. Your air filter lives inside an airbox, which probably looks like a big plastic cube taking up a sizable chunk of your engine bay. If you’re lucky, your airbox was designed to be opened with retaining snaps so you can swap out an air filter easily. And on cars with that particular feature, doing this trivial maintenance is just delightful. The second-generation Mitsubishi Montero’s air filter can be swapped in about 20 seconds thanks to these convenient clips. Installing a new air filter gives you instant gratification because a fresh one always looks so much prettier than an old one, and you get the joy of knowing that you’ve added both power and efficiency to your car without turning a single tool. The only other ways I can think of to get this kind of appreciable benefit from so little labor would be setting your tire pressure correctly, or filling the fuel tank. But then you don’t get to beam pridefully at the sight of a fresh part under your hood. I mean, even installing wiper blades is more annoying than dropping in a new air filter if your airbox opens with snaps. The air cleaner on a carbureted engine is similarly easy to swap, since the cover usually just comes off with a wing nut you can hand-loosen. But unfortunately, many modern cars use screws to secure their air boxes. If you own a car like that, I’m sorry to say you’ve been robbed of the deep pleasure that can only be derived from a tool-free repair. But unless your engine bay is rusted to hell, the task still probably isn’t much harder than making a few turns with a screwdriver. The modern car maintenance books hanging around my office all concur that you should change your car’s air filter about once a year, or every 12,000 miles, though AAA says that you can go as many as 20,000 miles between swapping air filters, though it’s a lot more often if you drive off-road. If you already knew that, you’re probably very familiar with the warm and fuzzy feeling of a fresh filter. If not, I’d say now is a great time to indulge yourself in this deeply satisfying aspect of automobile upkeep.